Proton shares jumped 11 per cent to a high of RM9.35 but later eased to close at RM9.15, an 8.3 per cent gain for the day after it’s board announced it’s on the lookout for a new CEO after the non-renewal of it’s current CEO Tengku Mahaleel Ariff’s contract. 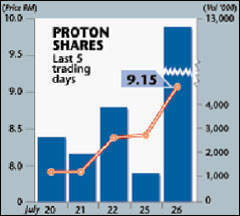 Trading was heavy, with 12.4 million Proton shares changing hands, more than 10 times the normal 1.1 million shares traded the day before. Investment firms raised their recommendations on Proton shares as it is believed the removal of Tengku Mahaleel will pave way for a successful tie-up with Volkswagen AG, including the German automobile manufacturer taking up a stake in Proton.